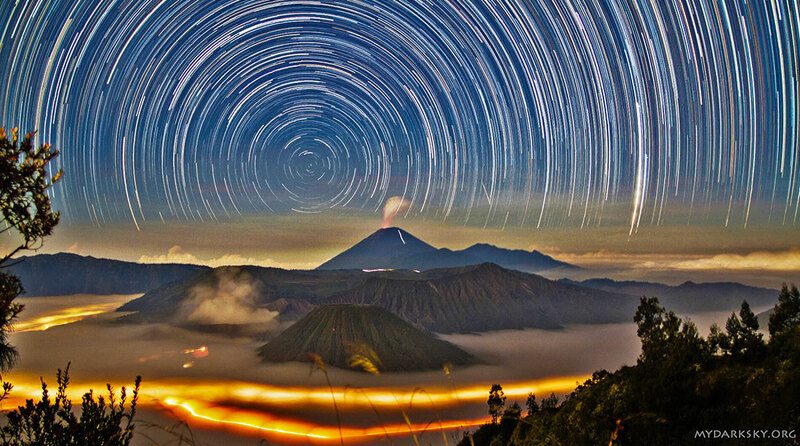 Startrails above Mount Bromo (Bromo Tengger Semeru National Park, Indonesia). June 20th 2014. During this period the moon will reach it’s new phase on Wednesday June 13th. At that time the moon will be located near the sun and will be invisible at night. This weekend the waning crescent moon will rise during the late morning hours but should not interfere with viewing meteor activity as long as you keep the moon out of your field of view. The estimated total hourly meteor rates for evening observers this week is 3 as seen from mid-northern latitude (45N) and 4 from the southern tropics (25S). For morning observers the estimated total hourly rates should be near 8 as seen from mid-northern latitudes (45N) and 11 from the southern tropics (25S). The actual rates will also depend on factors such as personal light and motion perception, local weather conditions, alertness and experience in watching meteor activity. Note that the hourly rates listed below are estimates as viewed from dark sky sites away from urban light sources. Observers viewing from urban areas will see less activity as only the brighter meteors will be visible from such locations. 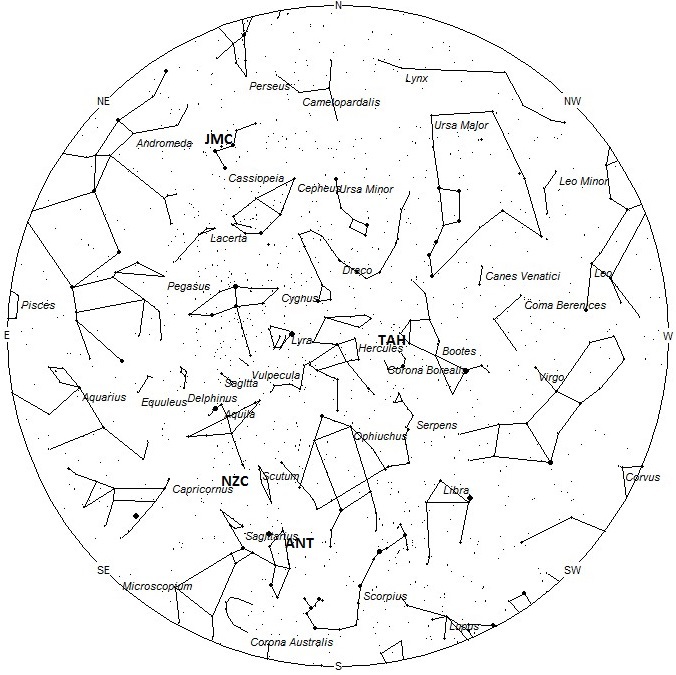 The center of the large Anthelion (ANT) radiant is currently located at 18:08 (272) -23. This position lies western Sagittarius, 3 degrees southwest of the 4th magnitude star known as Polis (mu Sagittarii). 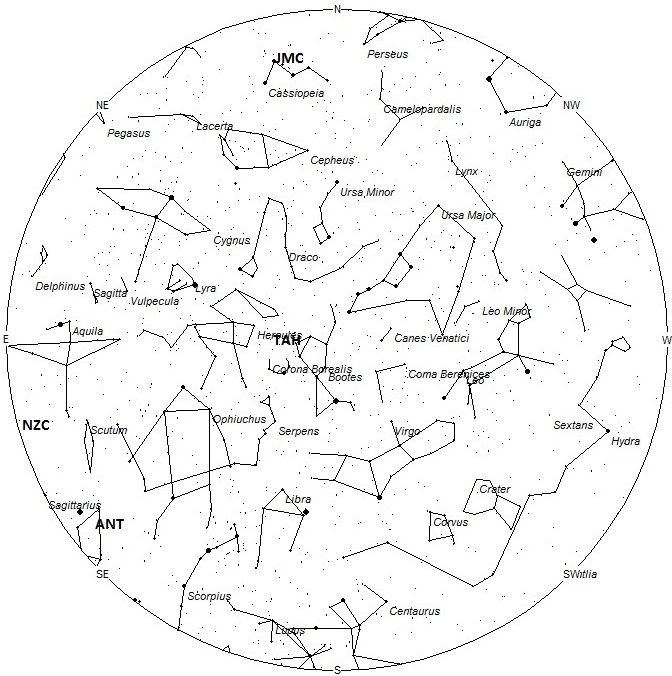 Due to the large size of this radiant, Anthelion activity may also appear from southeastern Ophiuchus as well as Sagittarius. This radiant is best placed near 0200 local daylight saving time (LDT), when it lies on the meridian and is located highest in the sky. Hourly rates at this time should be near 2 as seen from mid-northern latitudes and 3 as seen from tropical southern latitudes. With an entry velocity of 30 km/sec., the average Anthelion meteor would be of slow velocity. 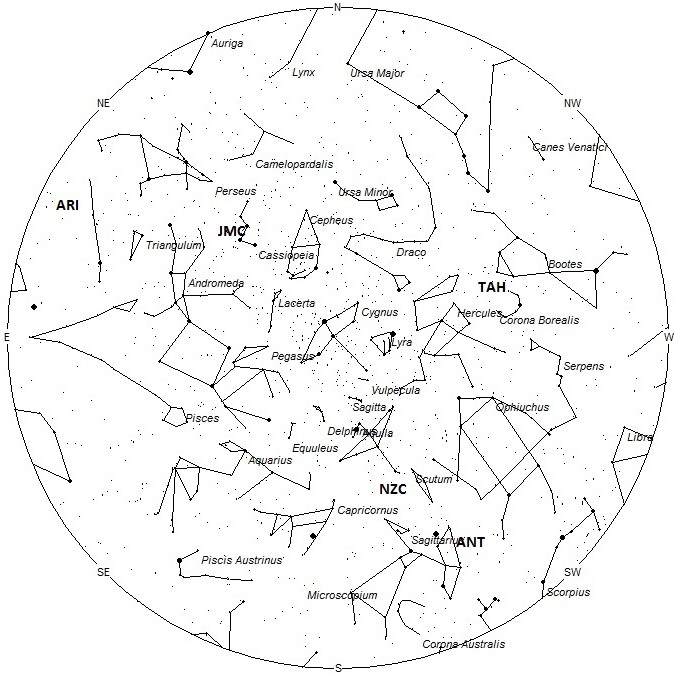 The Northern June Aquilids (NZC) may be seen this week from a radiant located at 19:12 (288) -11. This area of the sky is located in southern Aquila, 6 degrees south of the 3rd magnitude star known as Al Thalimain (lambda Aquilae). This radiant is best placed near 0300 LDT, when it lies on the meridian and is located highest in the sky. With the July 3rd maximum still 3 weeks away, hourly rates at this time will be less than 1 no matter your location. With an entry velocity of 38 km/sec., the average meteor from this source would be of medium-slow velocity.